YouTube Video Editor is a free online tool that enables you to edit, combine and make totally new videos make from the uploaded clips that you can find on the most popular video sharing website in the world – YouTube.com. All of those tools are presented to you in the easy to use and intuitive interface that encourages you to experiment and find new and innovative ways to express yourself. During the entire editing process you don’t need to worry about file sizes, formats and upload times. Everything is on the cloud. Your only job is to be creative, and use powerful YouTube Video Editor Online tools to bring your imagination to life. If you are already YouTube user who has uploaded several videos on your account, but you want to merge them, add some effect to them, edit them or create some kind of a totally new video, you don’t need to spent much thought how you can do that. By simply visiting YouTube.com/editor page you will gain access to one of the most intuitive, fast and easy to use video editor that you can find. After just a minute looking at its options and the way it enables you to effortlessly add and remove videos, cut them, rearrange them, add effects, transitions, text, and more, you will know that you really don’t need to waste your time with other online editors or standalone editing clients. Here you can find everything you need to mix videos however you want. YouTube Editor started its life many years ago, but it received large intake in new users after its visual overhaul that happened in 2010. It was then that YouTube developers started taking more serious attention at this tool, slowly increasing its capabilities and crafting its visual style, eventually reaching the point where their tool become very powerful and easy to use. Today’s version of this tool is the best one, with perfectlystreamlined process of creation and project management. 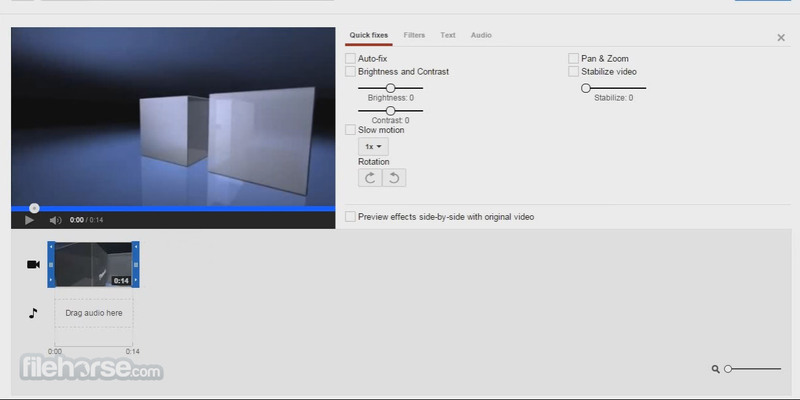 YouTube Editor Online tool is one of the many integrated tools that areavailable for free to everyone who has YouTube account. It enables everyone from novices to professionals to get access to basic editing tools for creating mashups of multiple videos, multiple audio streams and all several other tools that will help you to create great videos of many types and styles. YouTube Editor is very simple to use, being perfect for complete novices who are just starting to learn about video editing. Here they can learn basics of video compositing with vidoes that are already uploaded to their account (perfect for mixing several videos from your vacation, cutting one video into multiple parts), using Commons video as the part of their production, integrating photos into video editing, choosing audio background audio from YouTube large library of free songs, add as much translation effects between videos, and animated texts. With just a few minutes of acclimation, anyone will be ready to create their video mashup with your own YouTube videos. Each video segment that you want to use can be edited very precisely, with 4 basic edit categories that cover everything that you would need to create unique video – Quick Fixes (brightens, contrast, pan, zoom, stabilization, playback rate, rotation), Filters, Text (with all the needed text formatting options) and Audio. 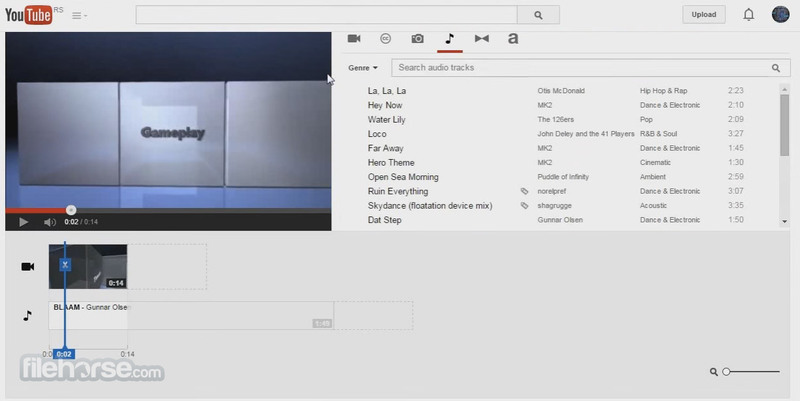 Interface of YouTube Editor consists from just one page that hosts 3 distinct elements. Video player, tool section and timeline section where you can use you mouse to move, cut and drag video and audio pieces in their intended position. Tool section has 6 tabs – My Videos, Creative Commons Videos, Photos, Audio, Transitions and Text. In addition to that, if you click on any video in the timeline section, you will get additional control screen with 4 tabs where you can individually tweak anything you want (those tabs are Quick Fixes, Filters, Text and Audio). All tools and elements are placed in excellent positions, enabling you quick access and streamlined use of all YouTube Editor features. 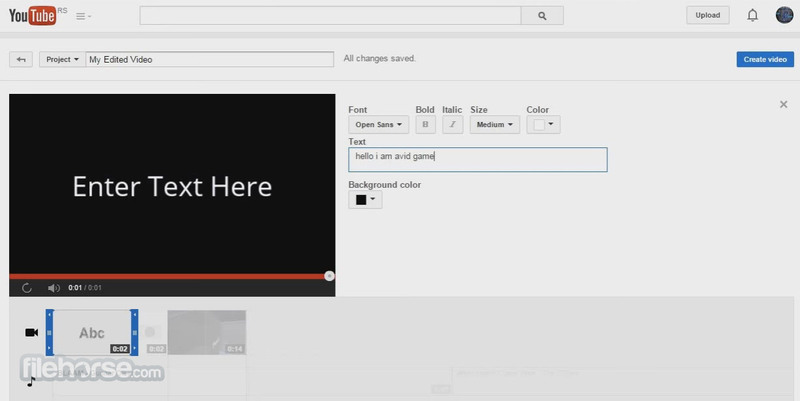 YouTube Editor is 100% free for anyone who has YouTube or Google account. There are no limitations for video size or complexity that you want to build, or any other restrictions. If you are already a user of YouTube, and your online account already has videos that you want to edit, then there is almost zero sense in you not at least trying YouTube Editor Software and seeing for yourself if it’svery large array of tools is enough for your needs. We fully recommend it. MagistoMagical video editing. In a click!